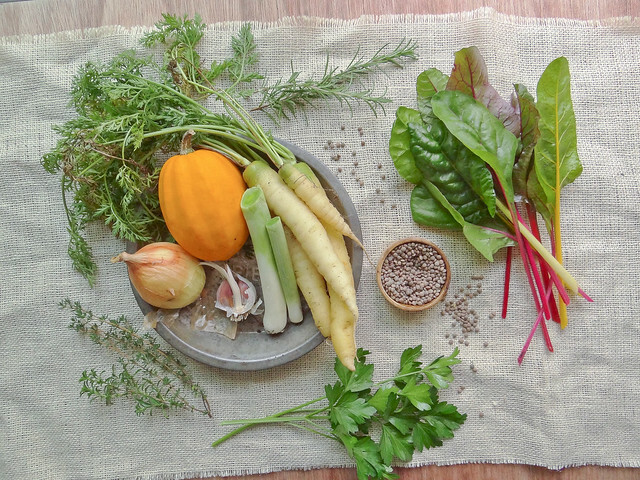 i am so thankful that we are able to continue to enjoy bounty from the garden - rainbow swiss chard, leeks, garlic, carrots, onions and winter squash are still plentiful. herbs are also good at braving the fall chill - basil & oregano, the most delicate of my herbs have since gone by but rosemary, thyme, winter savory, tarragon and parsley still thrive despite the cooler temps. soups are so perfect for using what you have on hand. 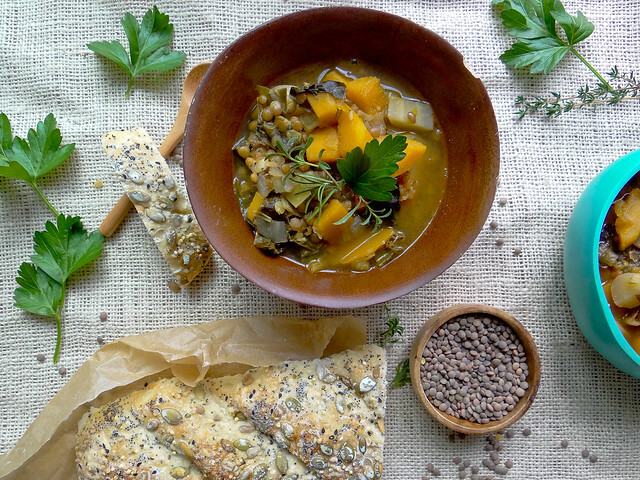 this particular recipe is very versatile depending on the season you are currently experiencing - spring lentil soup using asparagus, onions, baby spinach - summer lentil soup with zucchini, fresh tomatoes, green beans. quick, easy & healthy. 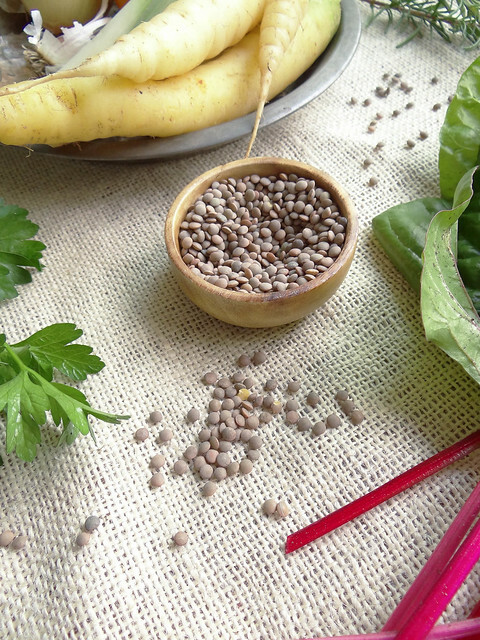 the spanish pardina lentils found their way into my shopping basket during my williams- sonoma legume & bean spree. they have a beautiful variety of heirloom beans, totally worth checking out. 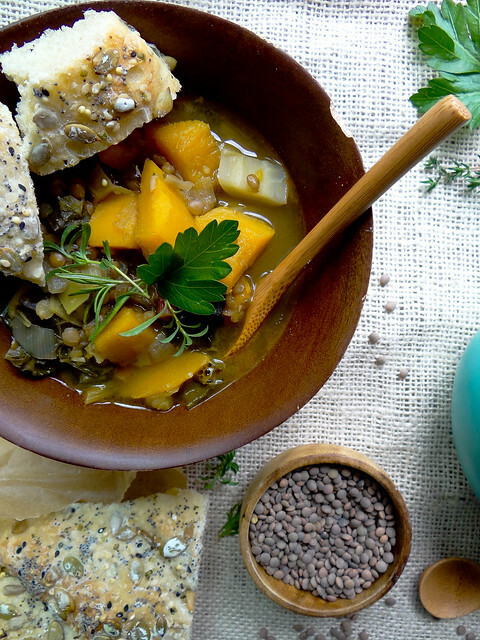 golden acorn squash, spanish pardina lentils, leeks, onion, garlic, rainbow swiss chard & carrots are paired with fresh rosemary, thyme and parsley. homemade veggie stock, also incredibly easy to make is highly recommended. certainly in a pinch you can use a good quality veggie broth or stock. homemade stock does take this soup to the next level - clean and bright. let's talk about my second favorite thing - bread! 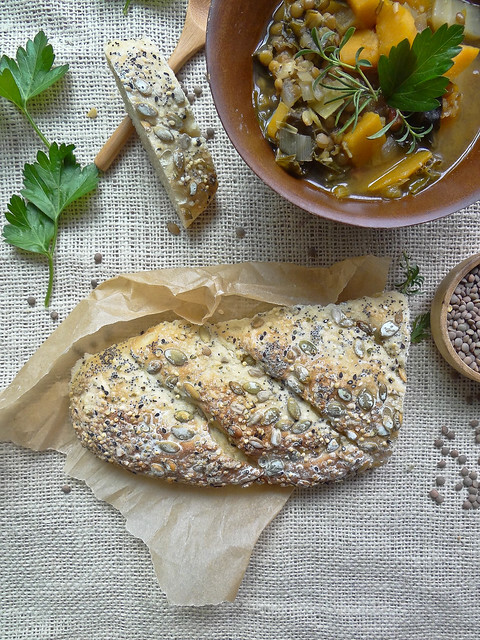 this seeded baguette to be precise - was the perfect accompaniment to a piping hot bowl of lentil soup. the baguette was made the day before - it was an impromptu recipe, i was craving homemade warm bread fresh from the oven so i made some. the recipe yields 2 small baguettes - perfect for weekend consumption. 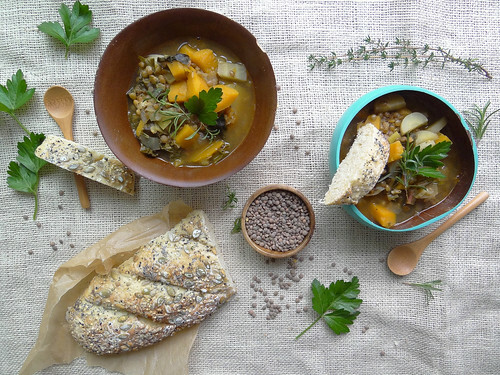 so in this post you get a 2 for 1 - a soup recipe and a baguette recipe. 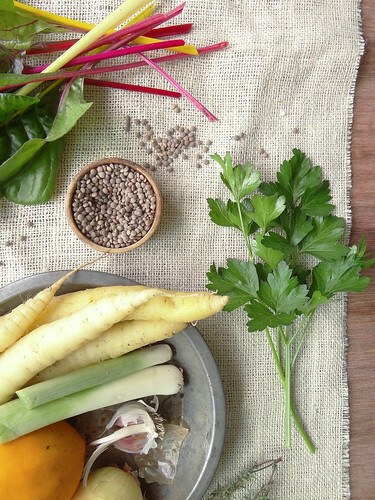 are you in the practice of making your own veggie stock? do you take advantage of lazy weekends or are you the type that can't sit still? in a medium soup pot over medium heat drizzle olive oil in the bottom of the pan, saute onions and garlic until fragrant. add carrots & leeks- saute until leeks begin to soften. add cubed acorn squash, veggie broth, lentils, swiss chard & herbs - bring to a boil. 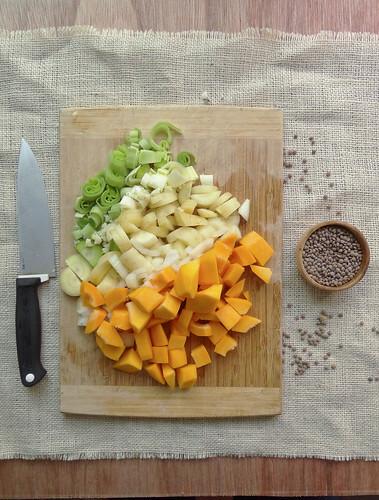 reduce to low heat and simmer for 25-30 minutes; until lentils are soft. season with salt & pepper - garnish with additional herbs. proof yeast in a medium mixing bowl by sprinkling yeast over warm water (not hot) - about 10 minutes until foamy & bubbly. with a wooden spoon stir in 2 1/2 -3 cups of flour - adding in salt & maple syrup while stirring. stir gently until ball of dough begins to form. turn dough out on a well floured surface, knead in remaining flour until ball of dough is smooth & elastic. after the first rise - about 1 hour until the dough has reached double in size, punch dough down and allow to rest for 10 minutes. turn dough out onto a well floured surface - knead just a couple of times. divide the dough ball into two equal pieces and form the baguette by rolling into a "log" with the ends tapering. on a piece of parchment paper spread your seeds - roll each baguette in the seeds with gentle pressure assuring the seeds stick. place baguettes on parchment lined baking sheet - cover and allow to rise a 2nd time, approximately 30 minutes or until double in size. place a rimmed metal baking sheet on the lower rack. brush the baguettes with the cornstarch wash - bake the bread on the center rack. to create steam for a crunchy crust pour a cup of hot water in the metal baking pan and quickly close the oven. bake for 12-15 minutes, the bread should be golden brown and when tapped on the bottom should sound hollow. allow to rest for 15 minutes prior to slicing. Saturday is my get everything done for Sunday day :) Justin and I only get one full day off a week together so we try and make the best of it! That bread is so beautiful! I have been scouring for a sourdough starter to make breads with again. You ARE awesome! #1) I'm jealous of your lovely fresh produce from the garden. #2) This baguette needs to be in my life asap! Thanks Meliss! You totally need that baguette in your life, you don't know what you are missing! 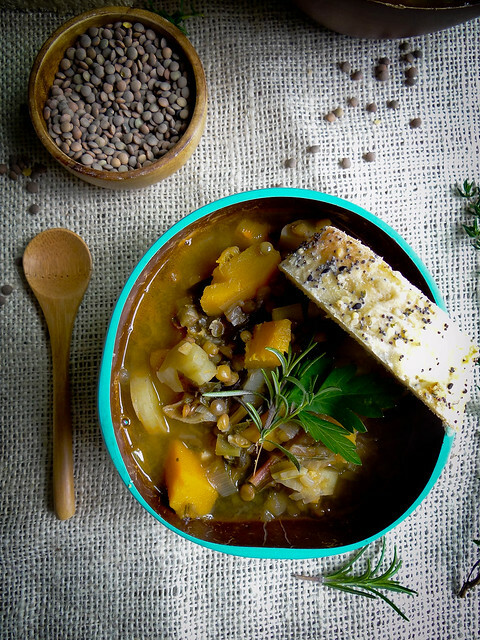 Sounds like a nice healthy soup to ward off Fall colds! I have to say I was eyeing the bread more than the soup though...and then I read that you actually made it yourself! It's beautiful with all those seeds on top! 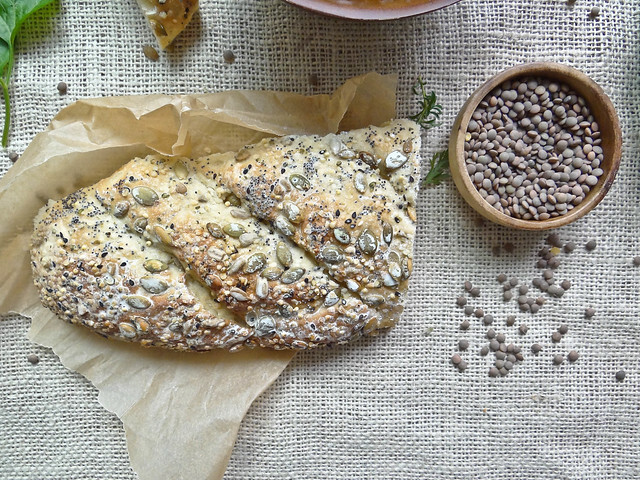 I love a seedy bread- they are so pretty and so good at the same time, add the soup and i am in total heaven! 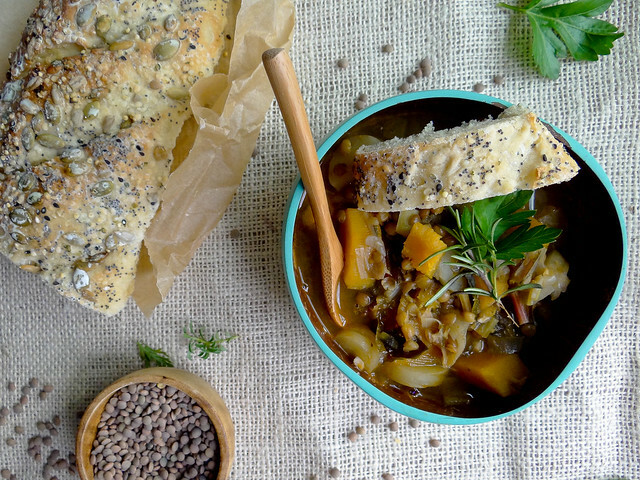 that is one gorgeous bread and soup! all that bounty form your garden. wow. ours is dying away slowly too. we harvested a bunch of thins past weekend, and will harvest the remaining stuff this weekend. 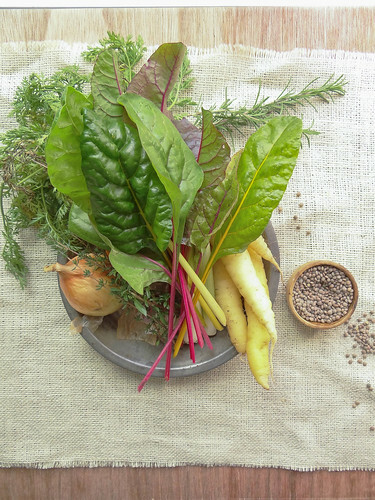 Did you grow herbs and dry them this year? What was your drying process...I need to go out and cut back all my hardy herbs and start drying them before he snow comes! Oh its true Uru - absolute heaven! Wow, that's all from your garden??? I love your rainbow chards! They look so delicate! That soup and that bread...I wish I had them both in front of me NOW! That bread looks wonderful. Yum! :) Soups looks really tasty too! Love all of the fresh herbs. Thanks Court- this truly is one of my favorite meals, bread and soup can't be beat! Are those white carrots? I thought they were parsnips! :) And yes, you are AWESOME. 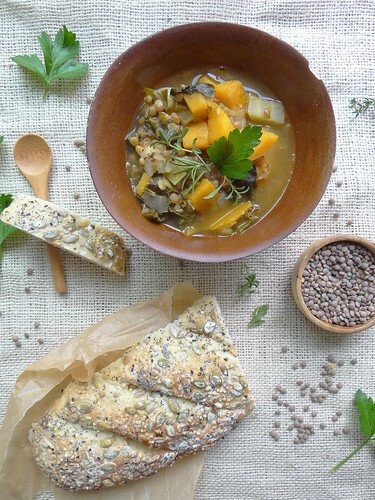 This soup, this bread and the photography as usual is just stunning! I love your Sunday ritual! That sounds so fabulous (especially as I read this on a Monday afternoon!). 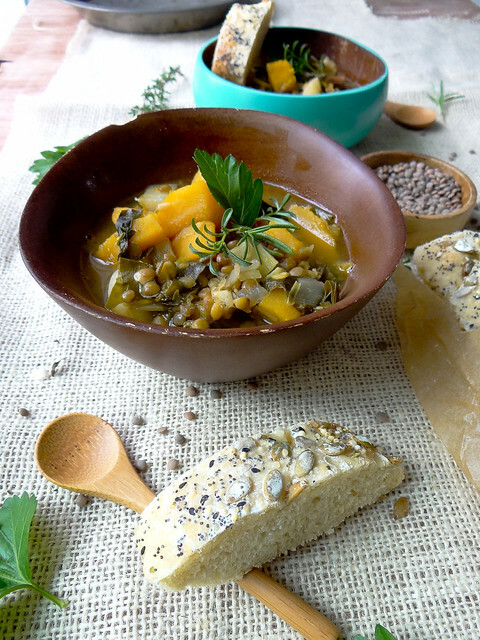 That soup looks so perfect for fall and I am lusting and drooling over that bread. Is there anything you can't do? Also- I love those bowls! Where are they from? Aren't the bowls great! The blue one is a Bambu brand- it is half of a coconut husk turned bowl, I had been lusting after these bowls at our local natural foods store and they finally went on sale!